Baked corn meal waffles are a perfect way to start the day. They are yummy and loved by people of all ages. They can be made with whole wheat, flour or corn meal. Many even eat it as a dessert with a scoop of ice cream on top. They are delicious with chocolate sauce, honey, maple syrup, strawberry sauce or butter. They can be your Sunday breakfast or a perfect dish at a family brunch. The recipe is fast and easy to follow. Top 3 Vegan Restaurants in Hollywood – and Beyond! 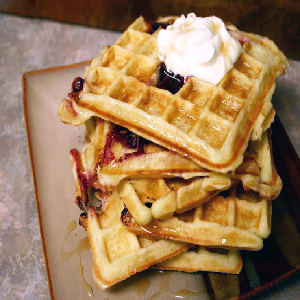 Start with preheating the waffle iron. Prepare it with oil and if you are making them in a large number, set your oven to 200 degrees. Take a big mixing bowl and add in baking powder, flour, baking soda, sugar and one teaspoon salt. Put a medium sized saucepan on heat. Put water and cornmeal inside, add half teaspoon of salt. The heat should be medium high and whisk the mixture steadily. Let the mixture simmer and let it cook for five minutes. The cornmeal will pull away from the sides as it gets cooked. Also the butter should be melted as you are cooking the cornmeal. Remove the pot from the stove and quickly add the melted butter, milk, yogurt, vanilla and beaten eggs. Whisk the mixture thoroughly and transfer it to the big mixing bowl. Check if the iron is hot, then take a measuring cup (1/2 cup size) and pour the batter on the iron. Spread it evenly so that it covers the plate. Let them cook until they are crispy and golden in colour. This will take around 5 minutes depending on the heat of your iron. They are best eaten fresh so serve them at once. If there is still is time to serve, put them in a warm oven, it will help them remain crispy.